In a Murmur I wrote a couple week ago, I talked about the fun and adrenaline rush of the creative writing process. 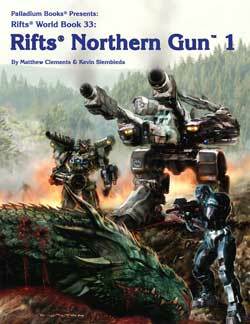 I also spoke about how excited I was about Rifts® Northern Gun™ One, and how it was almost done. All true. However, that process and writing is a damn slow one, especially when you are breaking new ground. This sourcebook is epic. According to Chuck Walton and Mark Dudley, it is groundbreaking. Chuck keeps telling me that the ideas and writing in this book are setting a whole new standard and benchmark for other writers to follow. Honestly, I’m too close to it to tell if that’s true or not. But I am trying to make every single robot special, different and, most of all, fun to play. I want every one of them to send your imaginations soaring. That, I know I’m accomplishing. But dang if it’s not a painstakingly slow process. 80% of my time for the past two weeks has been dedicated to writing and editing this book. Most days I've worked till 9 at night. Wednesday till 11:30. Heck, everybody is giving this book his all. Matthew Clements has done a fabulous job, especially on the overall concepts and background of NG (90% of it is Matt). Every single artist has outdone him or herself. As you read this, I should have finished my write-up for the NG Scorpion Battler and begun work on the Super-Max. When I’m done with Super-Max, there are only four robots to do a final edit and rewrite for, and then it’s on to the very last section of this book: NG Weapons and Miscellaneous Gear. Alex, Wayne and I will be working through the weekend. Matthew Clements is pitching in wherever needed. Typesetting and final layout of the last third of the book should start over the weekend. 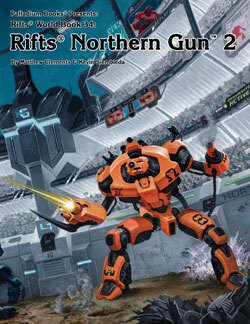 Rifts® Northern Gun™ One will go to the printer next week. I will dive into NG-2 as soon as I’m done with NG-1. It, too, is full of epic and fun new material – body armor, power armor, hovercycles, vehicles and the Robo-Arena. Artwork continues to come in for it, and I need to assign a bit more. Great stuff. Still shooting for a 2013 release. I have assigned the cover and will be assigning the artwork soon. Another great book. There is a lot of buzz about it at the office. Still shooting for a 2013 release. When we’re not working like mad on Rifts® Northern Gun™ One, Wayne and I are putting together The Rifter®. With any luck, we’ll have a surprise product release coming your way in October or early November. More on it later as things tighten up. Mike is working on his first art assignment since his stroke last Christmas. We've seen some other art he’s been noodling around with and it looks as good as ever. You can expect to continue to see Mike’s art grace many of the sourcebooks coming your way. Also in final production is Robotech® RPG Tactics™. The finished rule book, stat cards, box designs, and other elements are all in final production and starting to come in for final feedback and approval. ALL sculpts but one have been completed, approved and sent to manufacturing for mold-making. The game line is dynamic and powerful. Though there have been some unexpected delays at Ninja Division and in mold-making, we are still shooting for a December release. 80+ villains, rules for creating super organizations (good or bad, independent or government agencies), countless adventure ideas. Cat. No. 501. See the full description later in this Update. I've posted a few Murmurs and made a few posts on Facebook. I still need to catch up on my Private Messages, but I’m mostly caught up on my emails. More posts and insights will be coming your way. We have not been able to release many new products in 2013, but that’s about to change. We’re expecting at least three new releases plus The Rifter® #64 by the end of the year. Hopefully, four. And we have many exciting new books in development, and a few sitting on the shelf waiting to be put into production. The reason we have not released much new this year is a good one for us: Palladium has been making big strides in other areas. 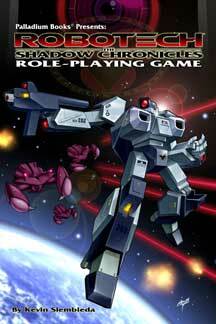 The most notable is Robotech® RPG Tactics™. This game line is going to be huge for Palladium. The Kickstarter was a great success, distributor orders are impressive, and the product is going to make the hearts of Robotech® fans and gamers sing. However, it has been a massive undertaking for Palladium Books and Ninja Division, and it ate up a lot of our time and resources. Much more than originally anticipated. Still, things are moving forward and Palladium grows stronger every single day. In addition to all of the above, we have been looking into developing new revenue streams and exploring new realms of possibilities. 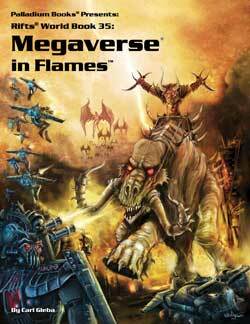 In fact, I have been talking with a few third parties about expanding the Palladium Megaverse into new mediums. Nothing is finalized yet, but we have at least two potential new partners and product lines under consideration as we head toward 2014. And that doesn't even include events like Detroit Fanfare, plans for a 2015 Palladium Open House, plans for the Palladium website or new developments within the company itself. There is a lot going on and coming your way. And you are going to love it all. Palladium Gaming events at Detroit Fanfare: We are beginning to touch base with all the Game Masters and Megaversal Ambassadors who have volunteered to run events to make this convention a mini-Palladium Open House. We have a BIG gaming and marketing opportunity with Detroit Fanfare (in Dearborn, Michigan, October 25-27, 2013) to showcase our games to newcomers as well as fellow gamers. The convention site is only 20 minutes from the Palladium office and we want to make it a fun ANNUAL event starting this year. Game Masters, Note: If you have not heard back from Palladium, you will be hearing from us soon. Here is what we need from you. How many games are you planning to run? Which day or days? Friday, Saturday, Sunday. Name of gaming event and the world setting (Rifts®, Robotech®, HU2, Palladium Fantasy®, Dead Reign, and so on). Number of players; i.e. 4-6, or up to 8, etc. Will there be pre-rolled character sheets for players? (We recommend, yes). Gamers: Come on down to join the fun. Game with Julius Rosenstein, Carmen Bellaire and others, enjoy Robotech® RPG Tactics™ demonstrations, meet and chat with the Palladium crew, get autographs, and game, game, game! Make sure you tell the convention people you are coming to game or to see Palladium Books. Harmony Gold’s Robotech® tour. Meet Steve Yun, enjoy Robotech® panels, and get autographs. I’ll probably even participate in a few. Robotech® RPG Tactics™ Max and Miriya Convention Exclusives. We are trying to get Ninja Division to get us 200 Max and Miriya mecha (same as those at Gen Con) available for sale at Detroit Fanfare. ND says they should be able to do so. We’ll keep you posted. - And more to be added . . .
Games run by Palladium creators, including Kevin Siembieda (me), Julius Rosenstein, Carmen Bellaire, Chuck Walton and others. I’ll try to get Mark Dudley to run, too. Plus there will be many other Palladium gaming events, demos, and more. Palladium Booth in the dealers’ hall plus some surprises if we can swing it. Many comic book guests – writers and artists. Detroit Fanfare is estimating 9,000-11,000 people to attend this October! And growing. It’s held at the Adoba Hotel (formerly the Hyatt Regency and only 20 minutes from the Palladium offices), in Dearborn, Michigan, October 25, 26 & 27, 2013. Join the fun. Click here for more information about Detroit Fanfare. 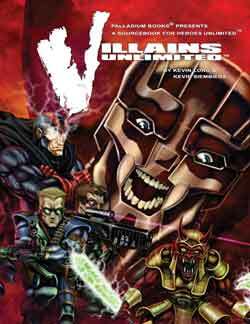 More than 80 villains with complete stats, background and motives for trouble. And lots of other epic source material. Rules for designing your own super-organization. S.C.R.E.T. – Superbeing Control Retrieval and Elimination Team. The Jury – are they heroes or villains? Fabricators, Inc. – the weapons and armor supplier to the criminal underworld. All of the above serve as catalysts for adventure. Written by Kevin Siembieda and Kevin Long. 224 pages – $24.95 – Cat. No. 501 – Available now. 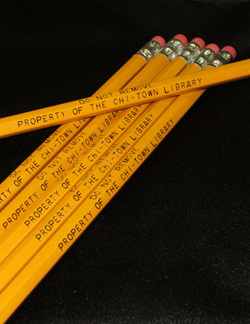 They’re fun and silly, and Rifts® gamers love them, so we pressed a new batch of Chi-Town Library pencils. They looks great on the gaming table. Printed on each are the words: Do Not Remove — Property of the Chi-Town Library. 50 cents each – Cat. No. 2561 – No. 2 pencil. Available now. All the famous mecha and action of Robotech® starts here with the Macross Saga when an alien armada enters Earth orbit. They have come to reclaim a lost spacecraft that crash-landed on Earth 10 years earlier. A space fortress that Earth’s protectors have rebuilt into their own flagship against alien invasion. The resulting conflict gives birth to heroes and becomes the stuff of legend, but the Earth will never be the same. 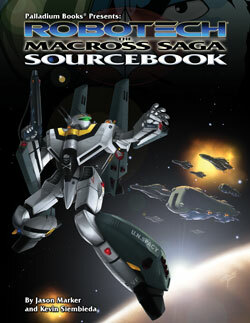 Robotech® The Macross® Saga Sourcebook now available as an 8½ x 11 inch sourcebook. Note: This is the setting for Robotech® RPG Tactics™, so if you’re looking for more information about the mecha, Earth’s defenders, the Zentraedi invaders, and the Macross Saga setting, this is the book for you. Epic adventure awaits. Bigger. Better. And close to completion! Jam-packed with a ton of background information about Northern Gun and Upper Michigan, combat robots, cargo haulers, drones, weapons, characters and adventure hooks galore. More than 30 new robots including drones. Northern Gun O.C.C.s and enforcers (the LPO). Interior Artwork by Chuck Walton, Mark Dudley, Amy Ashbaugh, and others. 192 pages – $24.95 retail – Cat. No. 887 – September release. Check out the FREE Advance Preview on DriveThruRPG.com! A new sneak preview will be coming in a couple weeks. 160 pages – $20.95 retail – Cat. No. 888 – October release. 192 pages – $24.95 retail – Cat. No. 876. November 2013 release. 160 pages – Cat. No. 553 – $20.95 – December, 2013 release. Imagine a world setting that is Earth 300 years after an apocalypse that results in the return of magic. Now imagine a world where magic and super-science collide. Where cyborgs and men clad in power armor and giant robots clash with demons, dragons and sorcerers. Now imagine lines of blue, magic energy rippling across the land. Where two or more of those lines cross, there is a tear in the fabric of space and time. A Rift to infinite worlds and realities that have unleashed an endless cavalcade of aliens, mutants and monsters into our world. Some are adventurers like you, other are invaders, some are slaves or prisoners, and still others are demonic nightmares and gods from ancient myths. All now make Earth their home or hunting ground. Welcome to Rifts®. Rifts® combines the genres of science fiction, fantasy, horror and post-apocalypse (among others) in a plausible setting where adventure is limited only by your imagination and the possibilities are truly infinite. 33 O.C.C.s – Bursters, Crazies, Cyber-Knights, Dog Boys, Glitter Boys, Juicers, Ley Line Walkers, Mind Melters, Psi-Stalkers, dragons, mutants & more. The Coalition States – heroes or villains? Coalition O.C.C.s, gear and States described. World information and background to set the stage for adventure. All the info you need to play is contained in this core rule book. Color end sheets painted by John Zeleznik. Cover by Scott Johnson. 24 pages of color, 75+ color images; great art throughout. Created and written by Kevin Siembieda. 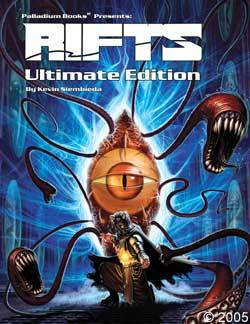 90+ sourcebooks to expand your Rifts® adventures. 376 pages – Cat. No. 800HC – $39.95 – Hardcover. All the data and details you need to role-play Robotech® are found in the Robotech® The Shadow Chronicles® RPG – core rule book. Available in two affordable formats, an 8½ x 11 inch hardcover edition ($30.95) and a pocket-sized “manga” edition (16.95). Play Veritech Pilots & Cyclone Riders. Play Battloid Aces and other heroes. Battle the Haydonites & Invid. Fast playing & quick combat. Quick Roll creation lets you create characters in under 15 minutes. $16.95 retail – 336 page Manga Edition – Cat. No. 550 – Manga size, fits in a pocket. Robotech® The Shadow Chronicles® RPG “Deluxe” Hardcover – space combat rules & select spacecraft, a few additional weapons, vehicles & artwork – $30.95 retail – 8½ x 11 Hardcover – 224 pages – Cat. No. 550HC. A signed and numbered, Gold Collector’s limited edition with a signed tip-in color print (nine autographs) is also available for $70.00 retail – 8½ x 11 – 224 pages – Cat. No. 5500HC. Robotech® fans, this is the game you’ve wanted for decades, with beautifully sculpted, in scale, game pieces and the fast action of Robotech®. Robotech® RPG Tactics™ is a fast-paced, tabletop combat game that captures the action and adventure of the Robotech® anime. Two or more players can engage in small squad skirmishes or scale up to massive battles. Relive the clashes of the First Robotech War, engage in stand-alone tactical games or use the dynamic game pieces to enhance your Robotech® RPG experience. Or simply collect your favorite mecha from an expanding range of top-notch game pieces. Rules by Alessio Cavatore, David Freeman and Carmen Bellaire. Full color, 128 page, softcover rule book; wraparound cover and lots of new, color artwork. 40 color game cards (unit cards, etc.). Release Date: Barring any unexpected delays, the Robotech® RPG Tactics™ box game and initial expansion sets ship Autumn 2013 (November?). $90 retail price (tentative). The price of the final box set is not yet determined, but we want to hold it around $90. Cat. No. 55100 (Main Boxed Game). The initial expansion packs will also ship in the Fall. All prices listed are likely, but still tentative. We want most packs to fall in the $25-$35 price range. UEDF Valkyrie Wing (2x each, Fighter, Guardian, Battloid) – Cat. No. 55201 – $30.00 retail (tentative). UEDF Destroid Pack (2x Tomahawks, 2x Defenders) – Cat. No. 55202 – $30.00 (tentative). UEDF Spartan Pack (2x Spartans, 2x Phalanxes), Cat. No. 55203 – $30.00 (tentative). Zentraedi Regult Battlepod Squadron (6x Regults) – Cat. No. 55401 – $30.00 (tentative). Zentraedi Support Battlepods (4x Artillery Battlepods) – Cat. No. 55402 – $30.00 (tentative). Zentraedi Command Pack (1x Glaug, 1x Quel-Regult, 1x Quel-Gulnau) – Cat. No. 55403 – $35.00 (tentative). Additional expansion packs at intervals throughout 2014. More will follow. Exactly how many, and how fast, will depend on manufacturing considerations, sales and customer demand. Palladium plans to release the mecha and settings for ALL eras of Robotech®. Many other details are still in development. Tournament play support is planned. Ninja Division will help Palladium to develop and launch the program sometime in 2014.